There are sunsets…and there are Sunsets. And then there are the sunsets on the Greek island of Santorini, particularly those you can see from the village of Oia. The daily setting of the sun off the northwestern part of this volcanic island is such an event that many people (local Greeks and visitors alike) plan their entire afternoons and evenings around them. Last year I got to witness this spectacle while traveling in the Greek islands with my family and some friends of ours. Our friends (Evan, Melissa and their son, Conner) lived in Athens and had been to Santorini several times. They wanted us to see everything they loved about the island including cliffs made of pumice, a red beach, a café that had the best saganaki (a cheesy appetizer I fell in love with), a breakfast place called Mama’s House (where you could actually get American breakfasts—a major plus for Conner, who missed those in the US) and much more. Highest on their list, however, was the white-washed village of Oia. They were adamant that we had to go there late in the day. We had to time it so we got there well in advance of the sunset (we were staying in the island’s main town, Fira, about a half-hour bus ride away). For the life of me, I couldn’t figure out why a sunset could be such a big deal and, frankly, after a long day of exploring the island, I was pretty zonked and not in the mood for anything. This sunset better be special, I thought to myself. After wondering around Oia’s really cute narrow streets, we made o ur way out to a point, where there were dozens, actually HUNDREDS of people milling around. Many looked like college kids, but there were plenty of families and couples of all ages too. As the sun started to make its way down and the sky deepened into an extravaganza of color, the party got bigger and bigger and louder and louder. Someone knocked over a cooler and water from melted ice was running everywhere but no one cared. 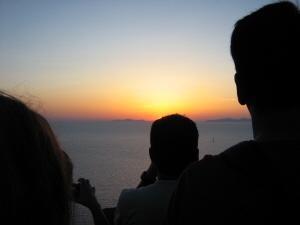 We were all gobsmacked by the setting sun as it got closer and closer to the Aegean Sea. Just before it disappeared, everyone starting counting down in unison and once it had set, we all burst into applause. It was like seeing the ball drop on New Year’s Eve in Times Square. And to think, it does this everyday. This sunset WAS special. I am glad I saw it. 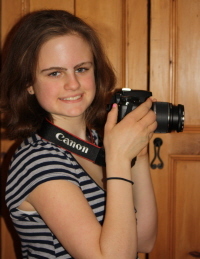 Just-Teens Travel is written by Justine Seligson, our teen columnist. To see more Just-Teens Travel columns, search for "Teen Travel" above.